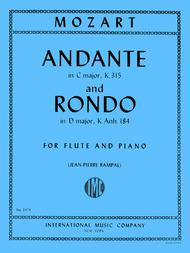 Andante in C major, K. 315 & Rondo in D major K. Anh. 184 composed by Wolfgang Amadeus Mozart (1756-1791). Edited by Rampal. For flute and piano. Published by International Music Company (IM.2474).